Andrew Sullivan, 51, of Heath Road, Lyng, mid-Norfolk, made more than £35,000 from selling the counterfeit goods on eBay, from 2009 to 2011. He pleaded guilty in September to selling counterfeit autographs with false authenticity documents. At Norwich Crown Court, Sullivan was sentenced to 21 months in prison. The court heard Sullivan admitted forging 3,500 autographs over a two year period. He also pleaded guilty to selling pictures of stars without their permission. 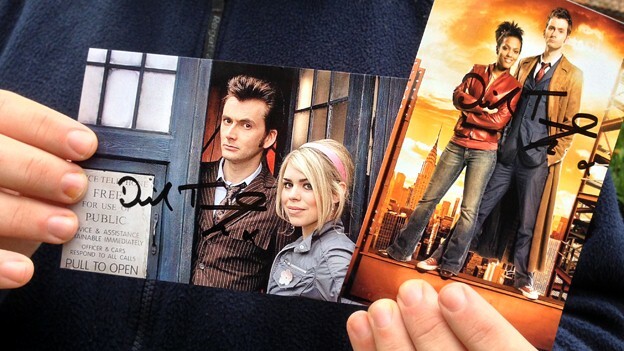 A tip off from an autograph collector, to Norfolk County Council's Trading Standards team, exposed Sullivan as selling the fake autographs, including former Doctor Who companion Billie Piper, actress Angelina Jolie and Caroline Munro who featured in The Spy Who Loved Me. 'Honesty and authenticity'Caroline Carter, from Norfolk Trading Standards, said: "When we visited Mr Sullivan's home office we found an Aladdin's den of materials that pointed to a significant business operation selling celebrity-related items online. "We also took away a container of ripped-up and discarded signed photographs which were later pieced together to reveal what looked to be mistakes. "The office was equipped with a high quality printer and paper and pens suitable for reproducing and marking up photographs and when we examined the office computer we found that it was storing scores of copyrighted images of famous people." The investigation was also supported by BBC Worldwide, which provided evidence the copyright for images being printed by Sullivan, onto which he inscribed the autographs, was owned by the BBC and they had not given him permission to reproduce or generate an income from them. David Wilson, prosecuting on behalf of trading standards, told the court: "The business of celebrity autographs clearly relies on honesty and authenticity. "The commission of these offences undermines the trust in this market and those who legitimately operate in it." David Collinson, Norfolk County Council's head of public protection, added: "Mr Sullivan was exploiting fans and carried out a sophisticated cottage industry fraud, he scammed possibly thousands of victims around the world. "We're very pleased with the result as 21 months custodial is a significant message to those people who will attempt to exploit people and use the gains that are available through the internet to try and catch people out."